I have never been much of an animal person. Debbie loves animals, and I love Debbie. So we compromised. Currently, we have three dogs and a cat. They all live inside. I wonder how many we would have if we hadn't compromised! 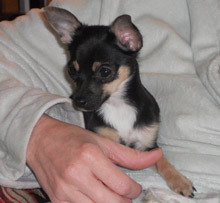 With our most recent pet arrival, a three-pound Chihuahua named Lil Pup, my heart toward pets has really changed. I am crazy about Lil Pup. She is so cute and so fun and so incredibly little. I just look at her and marvel at God's creative handiwork. Although Lil Pup thinks she is a Doberman, the truth is she is weak, frail, and in need of protection when other dogs are around (or other cats and even some good-sized kittens). On more than one occasion, I have had to come to the rescue of Lil Pup as the other pets were starting to get ticked-off with her puppy antics. As much as I am able, I will look out for Lil Pup. My heart for that little dog compels me to protect her. Sometimes we forget how much God loves us. Sometimes we fail to see the great heart He has for our protection and defense. Isaiah said, "For You have been a defense for the helpless, a defense for the needy in his distress, a refuge from the storm, a shade from the heat" (Isaiah 25:4). God protected His "Lil Pup" named Jeremiah. He was his "dread champion." And no one messes with the dread champion! Are you hurting today? Are your enemies closing in on you? Does life seem to have you in its jaws, thrashing you about? Do you feel as if God has forgotten your name, your address, your situation? Does it seem like curtains? Cry out to God! Cast all your worries and cares upon Him "BECAUSE HE CARES FOR YOU" (1 Peter 5:7). Listen, my friend, you are Lil Pup times a zillion to God. You could not be more precious to Him! He will be there in your hour of need. He will defend you in your time of danger and distress. Draw near to God and know that He will draw near to you in response (James 4:8). Call to Him and know that He will answer you (Jeremiah 33:3). Dear God, thank You for being a God who truly loves me, who truly cares. Thank You that You do know all that is going on in my life, and You have my back. Forgive me, Lord, for all the times I have believed the lie that you have given up on me or have forgotten me. Help me be aware of Your presence in my life. I trust You and Your protection. My life is in Your hands, and I know that You will see me through the worst of situations. Thank You for the unfathomable privilege of being Your Lil Pup. In Jesus' name. Amen.